Church's Chicken offers choice in a $5 value meal with the return of the $5 Real Big Deal for a limited time at participating restaurants. 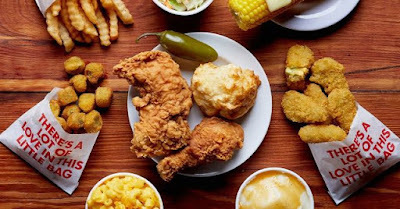 For $5, you can choose either two pieces of mixed fried chicken or three Tender Strips (original or spicy) plus two sides, a Honey-Butter Biscuit, and a jalapeno pepper that you can squeeze over the chicken for extra heat. The fried chicken chain is also offering the $15 Real Big Family Deal, which includes 12 pieces of fried chicken and two large sides for $15.